The Pavilion building was first erected at Bembridge, but later bought by Dickie Dawson of Regent House, Seaview - for many years the Seaview postmaster, he also had a gift shop on the lower corner of Circular Road, opposite Seaview Hotel. Around 1909 the only hall in the village was at the Assembly Rooms in lower Ryde Road (probably, the rooms behind the old Methodist Church). The transportation of the Pavilion from Bembridge to Seaview was made by Mr. William Chick of Seaview, who ran a carters business. With his horses he moved the larger sections on a borrowed hay wagon, leaving Bembridge as 6 a.m.
Mr. Thomas Lander managed the Pavilion and took over ownership when Dickie Dawson died. The building held about 200 people plus about 25 in the gallery. Six large mirrors helped make the hall appear larger, and there was a handrail on each side for the benefit of roller skaters. The drop curtain depicted Seagrove Bay with Horestone Point and the rocks in the back ground. During the first world war a new curtain was painted by W. H. F. Thompson, or ‘Budge’ as he was known, showing a Royal Navy destroyer at speed. During the ministry of the Rev. F. R. Dawson, a curate, the Rev. J. Pearson, a keen athlete, organised boxing practice. He recruited sparring partners but once had the worst of a session and carried the marks on his face over a weekend. As a result he was persuaded to discontinue the pursuit. During the first world war, many concerts were staged at the Pavilion in aid of the Red Cross and Forces’ Comforts Fund. The ‘Bem Boys’, a party from the R.N.A.S. seaplane base at Bembridge, and stationed at the Royal Spithead Hotel, often put on shows. Moving pictures were introduced to the Pavilion in about 1916, but the evening performances were never well patronised despite the lack of a bus service to Ryde at night. After the great war came a dancing boom, and some summers a resident concert party appeared at the Pavilion alternating with Shanklin-based casts. Concerts were also given by boys from Dr. Barnardo’s Homes with handbell and xylophone items. Before the I.W. Sports Club was built in Ryde Road, the Pavilion was used as a badminton club, and as a private school by a Mrs Bishop. Miss Lilian Lander, daughter of the proprietor, organised Sunday treats there and was the venue for Seaview Horticultural Society shows. Oakwood (the building in front of the Pavilion, Planning Permission granted 2016 to demolish and redevelop) was formerly an Army hut and was bought by Thomas Lander in the early 1920s and the family moved there from Victoria House in the High Street. After the first world war, another attempt was made to provide film shows at Seaview Pavilion, this time by a Mr. Mead, formerly employed at the old Ryde Cinema. The opening of the Scala Cinema, at Ryde, and the improved bus service were the main reasons for yet another failure. When Mr. Lander died in 1933 his widow managed the Pavilion, but later sold it to a Miss Noakes, of Little Selsdon (now Robin Hill). Interested in music and the theatre, she made considerable improvements, increasing the seating capacity by about 70, a new entrance hall, cloakroom and ticket office, central heating, proscenium and drop curtains. The re-opening featured radio entertainer Leonard Henry and several other well-known artistes. Later, dramatic plays were presented produced by Miss Bremner. The second world war put an end to many village activities, and the Pavilion was sold and made into a night club. Mr. Bill Bonnick, owner of the Old Fort Cafe, became the next owner, but the various organisations in the village failed to make full use of the facilities offered. In the 1950’s yet another attempt was made to start a cinema project. Film actor Barry Jones performed the opening ceremony, and starred in the first film, ‘The Clouded Yellow’, but with audiences seldom numbering no more than 10, the venture failed. The Pavilion was then used for making glass-fibre boats, and for light engineering. For long periods it was left unoccupied. 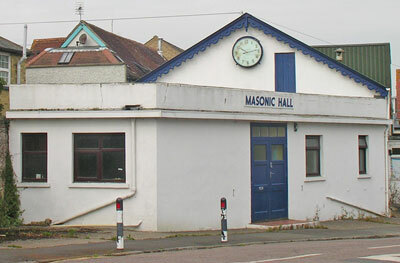 The Spithead Masonic Lodge took ownership in 1970 and it was renamed as the ‘Masonic Hall’. In 2015, Planning Permission was sought to demolish the hall and redevelop the site, however permission was not granted.